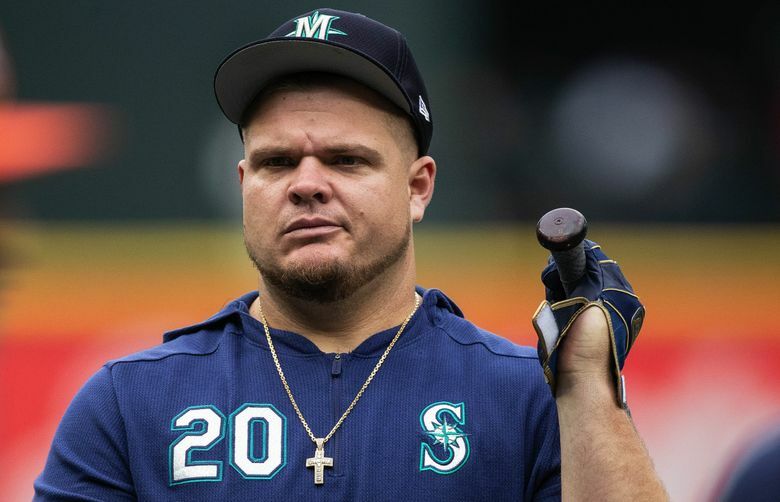 Daniel Vogelbach is in the Mariners clubhouse wearing a yellow shirt with the word “TANKS” stitched across his chest in red letters. He doesn’t know what it means. It was just a shirt that teammate Dee Gordon gave him and Dee isn’t around to explain. When the sun rose Saturday morning, the Mariners were 13-3 in their supposed “step-back” season, having scored 123 runs while sporting a .552 slugging percentage — both of which were tops in MLB. And the poster boy for such mashing has been Vogelbach, the 26-year-old who’s been abusing baseballs like no one else in the sport has this season. His slash line before taking the field was .400/.513/1.113, the slugging percentage being .175 points better than Angels star Mike Trout, who’s the major-league leader among qualified players. Since Vogelbach had only played in 10 games, he was 11 plate appearances short of qualification, but still managed to hit six home runs, which was tied for fourth in MLB. In Saturday’s 3-1 loss to Houston, he went 2 for 3 with two singles — adding to a career stretch for the designated hitter who has spent most of his pro baseball days in the minor leagues waiting for a shot. Through the first tenth of this season, though, he has been the top tank for a team plowing through everyone. Vogelbach’s most productive game this season came during a 12-5 win over the White Sox on April 7, when he hit two homers and drove in six runs. His most heroic game came against the Royals on Thursday, when he hit a game-winning solo home run in the top of the 10th. Entering Saturday’s game, the Orlando native had two more dingers this year than in his three previous seasons, which consisted of 144 plate appearances. What’s the saying again? Superhuman stretches come to those who wait. With Nelson Cruz socking around 40 home runs every year, Vogelbach wasn’t going to get a shot at being an everyday DH. And despite his minor-league dominance (Vogelbach had 20 home runs in 84 games in Class AAA Tacoma last year) he rarely delivered in his scattered big-league call-ups. Despite Seattle general manager Jerry Dipoto’s initial bullishness, Vogelbach struggled so badly in the spring of 2017 that he played just 16 major-league games. So he had to wonder if success in The Show was ever going to come. Like the Mariners, who just lost two straight for the first time this year, it’s safe to say that Vogelbach will regress. How deep that regression will be is the more important question. It’s uncertain how often Vogelbach will be in the lineup this season. He can play first base as well as DH, but so can fellow Mariners Edwin Encarcion and Jay Bruce, who entered Saturday’s game with a combined 11 home runs. Vogelbach’s used to that by now, though.